Medieval Islamic science had practical purposes as well as the goal of understanding. For example, astronomy was useful for determining the Qibla, the direction in which to pray, botany had practical application in agriculture, as in the works of Ibn Bassal and Ibn al-'Awwam, and geography enabled Abu Zayd al-Balkhi to make accurate maps. Islamic mathematicians such as Al-Khwarizmi, Avicenna and Jamshīd al-Kāshī made advances in algebra, trigonometry, geometry and Arabic numerals. Islamic doctors described diseases like smallpox and measles, and challenged classical Greek medical theory. Al-Biruni, Avicenna and others described the preparation of hundreds of drugs made from medicinal plants and chemical compounds. 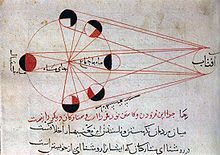 Islamic physicists such as Ibn Al-Haytham, Al-Bīrūnī and others studied optics and mechanics as well as astronomy, criticised Aristotle's view of motion. The Islamic era began in 622. Islamic armies conquered Arabia, Egypt and Mesopotamia, eventually displacing the Persian and Byzantine Empires from the region. Within a century, Islam had reached the area of present-day Portugal in the west and Central Asia in the east. The Islamic Golden Age (roughly between 692 and 945) spanned the periods of the Umayyad Caliphate (661-750) and, in particular, the early phase of the succeeding Abbasid Caliphate (750–1258), with stable political structures and flourishing trade. Major religious and cultural works of the Islamic empire were translated into Arabic. Islamic culture inherited Greek, Indic, Assyrian and Persian influences. A new common civilisation formed, based on Islam. An era of high culture and innovation ensued, with rapid growth in population and cities. The Arab Agricultural Revolution in the countryside brought more crops and improved agricultural technology, especially irrigation. This supported the larger population and enabled culture to flourish. From the 8th century onwards, scholars such as Al-Kindi translated Indian, Assyrian, Sasanian (Persian) and Greek knowledge, including the works of Aristotle, into Arabic. These translations supported advances by scientists across the Islamic world. Islamic science survived the initial Christian reconquest of Spain, including the fall of Seville in 1248, as work continued in the eastern centres (such as in Persia). After the completion of the Spanish reconquest in 1492, the Islamic world went into an economic and cultural decline. The Abbasid caliphate was followed by the Ottoman Empire (c. 1299–1922), centred in Turkey, and the Safavid Empire (1501–1736), centred in Persia, where work in the arts and sciences continued. Medieval Islamic scientific achievements encompassed a wide range of subject areas, especially mathematics, astronomy, and medicine. Other subjects of scientific inquiry included physics, alchemy and chemistry, ophthalmology, and geography and cartography. Alchemy, already well established before the rise of Islam, stemmed from the belief that substances comprised mixtures of the four Aristotelian elements (fire, earth, air, and water) in different proportions. Alchemists regarded gold as the noblest metal, and held that other metals formed a series down to the basest, such as lead. They believed, too, that a fifth element, the elixir, could transform a base metal into gold. Jabir ibn Hayyan (8th–9th centuries) wrote on alchemy, based on his own experiments. He described laboratory techniques and experimental methods that would continue in use when alchemy had transformed into chemistry. Ibn Hayyan identified many substances, including sulphuric and nitric acids. He described processes such as sublimation, reduction and distillation. He made use of equipment such as the alembic and the retort stand. Astronomy became a major discipline within Islamic science. Astronomers devoted effort both towards understanding the nature of the cosmos and to practical purposes. One application involved determining the Qibla, the direction to face during prayer. Another was astrology, predicting events affecting human life and selecting suitable times for actions such as going to war or founding a city. Al-Battani (850–922) accurately determined the length of the solar year. He contributed to the Tables of Toledo, used by astronomers to predict the movements of the sun, moon and planets across the sky. Copernicus (1473-1543) later used some of Al-Battani's astronomic tables. Al-Zarqali (1028–1087) developed a more accurate astrolabe, used for centuries afterwards. He constructed a water clock in Toledo, discovered that the Sun's apogee moves slowly relative to the fixed stars, and obtained a good estimate of its motion for its rate of change. Nasir al-Din al-Tusi (1201–1274) wrote an important revision to Ptolemy's 2nd-century celestial model. When Tusi became Helagu's astrologer, he was given an observatory and gained access to Chinese techniques and observations. He developed trigonometry as a separate field, and compiled the most accurate astronomical tables available up to that time. The spread of Islam across Western Asia and North Africa encouraged an unprecedented growth in trade and travel by land and sea as far away as Southeast Asia, China, much of Africa, Scandinavia and even Iceland. Geographers worked to compile increasingly accurate maps of the known world, starting from many existing but fragmentary sources. Abu Zayd al-Balkhi (850–934), founder of the Balkhī school of cartography in Baghdad, wrote an atlas called Figures of the Regions (Suwar al-aqalim). Al-Biruni (973–1048) measured the radius of the earth using a new method. It involved observing the height of a mountain at Nandana (now in Pakistan). Al-Idrisi (1100–1166) drew a map of the world for Roger, the Norman King of Sicily (ruled 1105-1154). He also wrote the Tabula Rogeriana (Book of Roger), a geographic study of the peoples, climates, resources and industries of the whole of the world known at that time. The Ottoman admiral Piri Reis (c. 1470–1553) made a map of the New World and West Africa in 1513. He made use of maps from Greece, Portugal, Muslim sources, and perhaps one made by Christopher Columbus. He represented a part of a major tradition of Ottoman cartography. Islamic mathematicians gathered, organised and clarified the mathematics they inherited from ancient Egypt, Greece, India, Mesopotamia and Persia, and went on to make innovations of their own. Islamic mathematics covered algebra, geometry and arithmetic. Algebra was mainly used for recreation: it had few practical applications at that time. Geometry was studied at different levels. Some texts contain practical geometrical rules for surveying and for measuring figures. Theoretical geometry was a necessary prerequisite for understanding astronomy and optics, and it required years of concentrated work. Early in the Abbasid caliphate (founded 750), soon after the foundation of Baghdad in 762, some mathematical knowledge was assimilated[by whom?] from the pre-Islamic Persian tradition in astronomy. Astronomers from India were invited to the court of the caliph in the late eighth century; they explained the rudimentary trigonometrical techniques used in Indian astronomy. Ancient Greek works such as Ptolemy's Almagest and Euclid's Elements were translated into Arabic. By the second half of the ninth century, Islamic mathematicians were already making contributions to the most sophisticated parts of Greek geometry. Islamic mathematics reached its apogee in the Eastern part of the Islamic world between the tenth and twelfth centuries. Most medieval Islamic mathematicians wrote in Arabic, others in Persian. Omar Khayyam's "Cubic equation and intersection of conic sections"
Al-Khwarizmi (8th–9th centuries) was instrumental in the adoption of the Hindu-Arabic numeral system and the development of algebra, introduced methods of simplifying equations, and used Euclidean geometry in his proofs. He was the first to treat algebra as an independent discipline in its own right, and presented the first systematic solution of linear and quadratic equations. :14 Ibn Ishaq al-Kindi (801–873) worked on cryptography for the Abbasid Caliphate, and gave the first known recorded explanation of cryptanalysis and the first description of the method of frequency analysis. 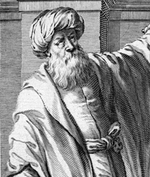 Avicenna (c. 980–1037) contributed to mathematical techniques such as casting out nines. Thābit ibn Qurra (835–901) calculated the solution to a chessboard problem involving an exponential series. Al-Farabi (c. 870–950) attempted to describe, geometrically, the repeating patterns popular in Islamic decorative motifs in his book Spiritual Crafts and Natural Secrets in the Details of Geometrical Figures. Omar Khayyam (1048–1131), known in the West as a poet, calculated the length of the year to within 5 decimal places. He found geometric solutions to all 13 forms of cubic equations. He developed some quadratic equations still in use. Jamshīd al-Kāshī (c. 1380–1429) is credited with several theorems of trigonometry, including the law of cosines, also known as Al-Kashi's Theorem. He has been credited with the invention of decimal fractions, and with a method like Horner's to calculate roots. He calculated π correctly to 17 significant figures. Sometime around the seventh century, Islamic scholars adopted the Hindu-Arabic numerals, describing their use in a standard type of text fī l-ḥisāb al hindī, (On the numbers of the Indians). A distinctive Western Arabic variant of the Eastern Arabic numerals began to emerge around the 10th century in the Maghreb and Al-Andalus (sometimes called ghubar numerals, though the term is not always accepted), which are the direct ancestor of the modern Arabic numerals used throughout the world. Islamic society paid careful attention to medicine, following a hadith enjoining the preservation of good health. Its physicians inherited knowledge and traditional medical beliefs from the civilisations of classical Greece, Rome, Syria, Persia and India. These included the writings of Hippocrates such as on the theory of the four humours, and the theories of Galen. al-Razi (c. 854–925/935) identified smallpox and measles, and recognized fever as a part of the body's defenses. He wrote a 23-volume compendium of Chinese, Indian, Persian, Syriac and Greek medicine. al-Razi questioned the classical Greek medical theory of how the four humours regulate life processes. He challenged Galen's work on several fronts, including the treatment of bloodletting, arguing that it was effective. al-Zahrawi (936–1013) was a surgeon whose most important surviving work is referred to as al-Tasrif (Medical Knowledge). It is a 30-volume set mainly discussing medical symptoms, treatments, and pharmacology. The last volume, on surgery, describes surgical instruments, supplies, and pioneering procedures. Avicenna (c. 980–1037) wrote the major medical textbook, The Canon of Medicine. Ibn al-Nafis (1213–1288) wrote an influential book on medicine; it is believed[by whom?] to have replaced Avicenna's Canon in the Islamic world. He wrote commentaries on Galen and on Avicenna's works. One of these commentaries, discovered in 1924, described the circulation of blood through the lungs. Ibn al-Haytham (Alhazen), (965–1039 Iraq). A polymath, considered to be the father of modern scientific methodology due to his emphasis on experimental data and on the reproducibility of its results. Optics developed rapidly in this period. By the ninth century, there were works on physiological, geometrical and physical optics. Topics covered included mirror reflection. 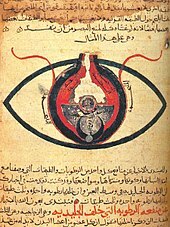 Hunayn ibn Ishaq (809–873) wrote the book Ten Treatises on the Eye; this remained influential in the West until the 17th century. Abbas ibn Firnas (810–887) developed lenses for magnification and the improvement of vision. Ibn Sahl (c. 940–1000) discovered the law of refraction known as Snell's law. He used the law to produce the first Aspheric lenses that focused light without geometric aberrations. In the eleventh century Ibn al-Haytham (Alhazen, 965–1040) rejected the Greek ideas about vision, whether the Aristotelian tradition that held that the form of the perceived object entered the eye (but not its matter), or that of Euclid and Ptolemy which held that the eye emitted a ray. Al-Haytham proposed in his Book of Optics that vision occurs by way of light rays forming a cone with its vertex at the center of the eye. He suggested that light was reflected from different surfaces in different directions, thus causing objects to look different. He argued further that the mathematics of reflection and refraction needed to be consistent with the anatomy of the eye. He was also an early proponent of the scientific method, the concept that a hypothesis must be proved by experiments based on confirmable procedures or mathematical evidence, five centuries before Renaissance scientists. Advances in botany and chemistry in the Islamic world encouraged developments in pharmacology. Muhammad ibn Zakarīya Rāzi (Rhazes) (865–915) promoted the medical uses of chemical compounds. Abu al-Qasim al-Zahrawi (Abulcasis) (936–1013) pioneered the preparation of medicines by sublimation and distillation. His Liber servitoris provides instructions for preparing "simples" from which were compounded the complex drugs then used. Sabur Ibn Sahl (died 869) was the first physician to describe a large variety of drugs and remedies for ailments. Al-Biruni (973–1050) wrote the Kitab al-Saydalah (The Book of Drugs), describing in detail the properties of drugs, the role of pharmacy and the duties of the pharmacist. Ibn Sina (Avicenna) described 700 preparations, their properties, their mode of action and their indications. He devoted a whole volume to simples in The Canon of Medicine. Works by Masawaih al-Mardini (c. 925–1015) and by Ibn al-Wafid (1008–1074) were printed in Latin more than fifty times, appearing as De Medicinis universalibus et particularibus by Mesue the Younger (died 1015) and as the Medicamentis simplicibus by Abenguefit (c. 997 – 1074) respectively. Peter of Abano (1250–1316) translated and added a supplement to the work of al-Mardini under the title De Veneris. Al-Muwaffaq, in the 10th century, wrote The foundations of the true properties of Remedies, describing chemicals such as arsenious oxide and silicic acid. He distinguished between sodium carbonate and potassium carbonate, and drew attention to the poisonous nature of copper compounds, especially copper vitriol, and also of lead compounds. Islamic physicians such as Ibn Sina described clinical trials for determining the efficacy of medical drugs and substances. The fields of physics studied in this period, apart from optics and astronomy which are described separately, are aspects of mechanics: statics, dynamics, kinematics and motion. In the sixth century John Philoponus (c. 490 – c. 570) rejected the Aristotelian view of motion. He argued instead that an object acquires an inclination to move when it has a motive power impressed on it. In the eleventh century Ibn Sina adopted roughly the same idea, namely that a moving object has force which is dissipated by external agents like air resistance. Ibn Sina distinguished between "force" and "inclination" (mayl); he claimed that an object gained mayl when the object is in opposition to its natural motion. He concluded that continuation of motion depends on the inclination that is transferred to the object, and that the object remains in motion until the mayl is spent. He also claimed that a projectile in a vacuum would not stop unless it is acted upon. That view accords with Newton's first law of motion, on inertia. As a non-Aristotelian suggestion, it was essentially abandoned until it was described as "impetus" by Jean Buridan (c. 1295–1363), who was influenced by Ibn Sina's Book of Healing. In the Shadows, Abū Rayḥān al-Bīrūnī (973–1048) describes non-uniform motion as the result of acceleration. Ibn-Sina's theory of mayl tried to relate the velocity and weight of a moving object, a precursor of the concept of momentum. Aristotle's theory of motion stated that a constant force produces a uniform motion; Abu'l-Barakāt al-Baghdādī (c. 1080 – 1164/5) disagreed, arguing that velocity and acceleration are two different things, and that force is proportional to acceleration, not to velocity. Ibn Bajjah (Avempace, c. 1085–1138) proposed that for every force there is a reaction force. While he did not specify that these forces be equal, this was still an early version of Newton's third law of motion. The Banu Musa brothers, Jafar-Muhammad, Ahmad and al-Hasan (c. early 9th century) invented automated devices described in their Book of Ingenious Devices. Many classical works, including those of Aristotle, were transmitted from Greek to Syriac, then to Arabic, then to Latin in the Middle Ages. Aristotle's zoology remained dominant in its field for two thousand years. The Kitāb al-Hayawān (كتاب الحيوان, English: Book of Animals) is a 9th-century Arabic translation of History of Animals: 1–10, On the Parts of Animals: 11–14, and Generation of Animals: 15–19. The book was mentioned by Al-Kindī (died 850), and commented on by Avicenna (Ibn Sīnā) in his The Book of Healing. Avempace (Ibn Bājja) and Averroes (Ibn Rushd) commented on and criticised On the Parts of Animals and Generation of Animals. Historians of science differ in their views of the significance of the scientific accomplishments in the medieval Islamic world. The traditionalist view, exemplified by Bertrand Russell, holds that Islamic science, while admirable in many technical ways, lacked the intellectual energy required for innovation and was chiefly important for preserving ancient knowledge, and handing it on to medieval Europe. The revisionist view, exemplified by Abdus Salam, George Saliba and John M. Hobson holds that a Muslim scientific revolution occurred during the Middle Ages. Scholars such as Donald Routledge Hill and Ahmad Y. Hassan argue that Islam was the driving force behind these scientific achievements. According to Ahmed Dallal, science in medieval Islam was "practiced on a scale unprecedented in earlier human history or even contemporary human history". Toby Huff takes the view that, although science in the Islamic world did produce localized innovations, it did not lead to a scientific revolution, which in his view required an ethos that existed in Europe in the twelfth and thirteenth centuries, but not elsewhere in the world. Will Durant, Fielding H. Garrison, Hossein Nasr and Bernard Lewis held that Muslim scientists helped in laying the foundations for an experimental science with their contributions to the scientific method and their empirical, experimental and quantitative approach to scientific inquiry. James E. McClellan III and Harold Dorn, reviewing the place of Islamic science in world history, comment that the positive achievement of Islamic science was simply to flourish, for centuries, in a wide range of institutions from observatories to libraries, madrasas to hospitals and courts, both at the height of the Islamic golden age and for some centuries afterwards. It plainly did not lead to a scientific revolution like that in Early modern Europe, but in their view, any such external comparison is just an attempt to impose "chronologically and culturally alien standards" on a successful medieval culture. ^ Hodgson, Marshall (1974). The Venture of Islam; Conscience and History in a World Civilisation Vol 1. University of Chicago. pp. 233–238. ISBN 978-0-226-34683-0. ^ "Al-Kindi". Stanford Encyclopedia of Philosophy. 17 March 2015. ^ a b Robinson, Francis, ed. (1996). The Cambridge Illustrated History of the Islamic World. Cambridge University Press. pp. 228–229. ^ Lagerkvist, Ulf (2005). The Enigma of Ferment: from the Philosopher's Stone to the First Biochemical Nobel Prize. World Scientific Publishing. p. 32. ISBN 9789812564214. ^ Linton (2004), p.97). Owing to the unreliability of the data al-Zarqali relied on for this estimate, its remarkable accuracy was fortuitous. ^ a b Zaimeche, Salah (August 2002). "Agriculture in Muslim civilisation : A Green Revolution in Pre-Modern Times". Muslim Heritage. ^ "Ibn Baṣṣāl: Dīwān al-filāḥa / Kitāb al-qaṣd wa'l-bayān". The Filaha Texts Project: The Arabic Books of Husbandry. Retrieved 11 April 2017. ^ Pingree, David. "BĪRŪNĪ, ABŪ RAYḤĀN iv. Geography". Encyclopædia Iranica. Columbia University. ISBN 978-1-56859-050-9. ^ Meri, Josef W. (January 2006). Medieval Islamic Civilization, Volume 1: An Encyclopedia. Routledge. pp. 484–485. ISBN 978-0-415-96691-7. ^ Hogendijk, Jan P.; Berggren, J. L. (1989). "Episodes in the Mathematics of Medieval Islam by J. Lennart Berggren". Journal of the American Oriental Society. 109 (4): 697–698. doi:10.2307/604119. JSTOR 604119. ^ Gandz, S. (1936), "The Sources of Al-Khowārizmī's Algebra", Osiris, 1: 263–277 , page 263–277: "In a sense, al-Khwarizmi is more entitled to be called "the father of algebra" than Diophantus because al-Khwarizmi is the first to teach algebra in an elementary form and for its own sake, Diophantus is primarily concerned with the theory of numbers". ^ Maher, P. (1998). From Al-Jabr to Algebra. Mathematics in School, 27(4), 14–15. ^ Broemeling, Lyle D. (1 November 2011). "An Account of Early Statistical Inference in Arab Cryptology". The American Statistician. 65 (4): 255–257. doi:10.1198/tas.2011.10191. ^ Al-Kadi, Ibrahim A. (1992). "The origins of cryptology: The Arab contributions". Cryptologia. 16 (2): 97–126. doi:10.1080/0161-119291866801. ^ O'Connor, John J.; Robertson, Edmund F., "Ghiyath al-Din Jamshid Mas'ud al-Kashi", MacTutor History of Mathematics archive, University of St Andrews. ^ Jim Al-Khalili (4 January 2009). "The 'first true scientist'". BBC News. Ibn al-Haytham is regarded as the father of the modern scientific method. ^ Tracey Tokuhama-Espinosa (2010). Mind, Brain, and Education Science: A Comprehensive Guide to the New Brain-Based Teaching. W. W. Norton & Company. p. 39. ISBN 9780393706079. Alhazen (or Al-Haytham; 965–1039 CE) was perhaps one of the greatest physicists of all times and a product of the Islamic Golden Age or Islamic Renaissance (7th–13th centuries). He made significant contributions to anatomy, astronomy, engineering, mathematics, medicine, ophthalmology, philosophy, physics, psychology, and visual perception and is primarily attributed as the inventor of the scientific method, for which author Bradley Steffens (2006) describes him as the "first scientist". ^ K. B. Wolf, "Geometry and dynamics in refracting systems", European Journal of Physics 16, p. 14–20, 1995. ^ Dallal, Ahmad (2010). Islam, Science, and the Challenge of History. Yale University Press. pp. 38–39. ^ Lindberg, David C. (1976). Theories of Vision from al-Kindi to Kepler. University of Chicago Press, Chicago. ISBN 978-0-226-48234-7. OCLC 1676198. ^ El-Bizri, Nader (2005). A Philosophical Perspective on Alhazen's Optics. Arabic Sciences and Philosophy, Vol. 15. Cambridge University Press. pp. 189–218. ^ El-Bizri, Nader (30 March 2011). "Ibn al-Haytham". Muslim Heritage. Retrieved 9 July 2017. ^ Haq, Syed (2009). "Science in Islam". Oxford Dictionary of the Middle Ages. ISSN 1703-7603. Retrieved 22 October 2014. ^ G. J. Toomer. Review on JSTOR, Toomer's 1964 review of Matthias Schramm (1963) Ibn Al-Haythams Weg Zur Physik Toomer p.464: "Schramm sums up [Ibn Al-Haytham's] achievement in the development of scientific method." ^ Gorini, Rosanna (October 2003). "Al-Haytham the man of experience. First steps in the science of vision" (PDF). Journal of the International Society for the History of Islamic Medicine. 2 (4): 53–55. Retrieved 25 September 2008. ^ Levey, M. (1973). Early Arabic Pharmacology. E. J. Brill. ^ Meinert CL, Tonascia S (1986). Clinical trials: design, conduct, and analysis. Oxford University Press, USA. p. 3. ISBN 978-0-19-503568-1. ^ a b Sayili, Aydin (1987). "Ibn Sina and Buridan on the Motion the Projectile". Annals of the New York Academy of Sciences. 500 (1): 477–482. doi:10.1111/j.1749-6632.1987.tb37219.x. ^ Espinoza, Fernando (2005). "An Analysis of the Historical Development of Ideas About Motion and its Implications for Teaching". Physics Education. 40 (2): 139–146. doi:10.1088/0031-9120/40/2/002. ^ "Biography of Al-Biruni". University of St. Andrews, Scotland. ^ Pines, Shlomo (1986). Studies in Arabic versions of Greek texts and in mediaeval science. 2. Brill Publishers. p. 203. ISBN 978-965-223-626-5. ^ Franco, Abel B. "Avempace, Projectile Motion, and Impetus Theory". Journal of the History of Ideas. 64 (4): 543. ^ Lindberg, David (1978). Science in the Middle Ages. University of Chicago Press. pp. 23, 56. ^ Selin, Helaine, ed. (1997). Encyclopaedia of the History of Science, Technology, and Medicine in Non-Western Cultures. Kluwer Academic Publishers. pp. 151, 235, 375. ^ Hoffman, Eva R. (2013). Translating Image and Text in the Medieval Mediterranean World between the Tenth and Thirteenth Centuries. Mechanisms of Exchange: Transmission in Medieval Art and Architecture of the Mediterranean, ca. 1000–1500. Brill. pp. 288–. ISBN 978-90-04-25034-5. ^ Kruk, R., 1979, The Arabic Version of Aristotle's Parts of Animals: book XI–XIV of the Kitab al-Hayawan, Royal Netherlands Academy of Arts and Sciences, Amsterdam-Oxford 1979. ^ Contadini, Anna (2012). A World of Beasts: A Thirteenth-Century Illustrated Arabic Book on Animals (the Kitab Na't al-Hayawan) in the Ibn Bakhtishu' Tradition). Leiden: Brill. ISBN 9789004222656. ^ Leroi, Armand Marie (2014). The Lagoon: How Aristotle Invented Science. Bloomsbury. pp. 354–355. ISBN 978-1-4088-3622-4. ^ Dallal, Ahmad (2010). Islam, science, and the challenge of history. Yale University Press. p. 12. ISBN 978-0-300-15911-0. ^ Huff, Toby E. (2003) . The Rise of Early Modern Science: Islam, China and the West (2nd ed.). Cambridge University Press. pp. 209–239 and passim. ISBN 978-0-521-52994-5. ^ Huff, Toby E. (2003). The Rise of Early Modern Science: Islam, China, and the West. Cambridge University Press. ISBN 978-0-521-52994-5. ^ Saliba, George (Autumn 1999). "Seeking the Origins of Modern Science? Review of Toby E. Huff, The Rise of Early Modern Science: Islam, China and the West". Bulletin of the Royal Institute for Inter-Faith Studies. 1 (2). ^ Will Durant (1980). The Age of Faith (The Story of Civilization, Volume 4), p. 162–186. Simon & Schuster. ISBN 0-671-01200-2. ^ Nasr, Hossein (1976). Islamic Science: An Illustrated Study. ISBN 978-0-905035-02-4. ^ Lewis, Bernard (2001). What Went Wrong? : Western Impact and Middle Eastern Response. Oxford University Press. p. 79. ISBN 978-0-19-514420-8. Hobson, John M. (2004). The Eastern Origins of Western Civilisation. Cambridge University Press. ISBN 978-0-521-54724-6. Linton, Christopher M. (2004). From Eudoxus to Einstein—A History of Mathematical Astronomy. Cambridge University Press. ISBN 978-0-521-82750-8. Masood, Ehsan (2009). Science and Islam: A History. Icon Books. ISBN 978-1-785-78202-2. McClellan, James E. III; Dorn, Harold, eds. (2006). Science and Technology in World History (2 ed.). Johns Hopkins. ISBN 978-0-8018-8360-6. Morelon, Régis; Rashed, Roshdi (1996). Encyclopedia of the History of Arabic Science. 3. Routledge. ISBN 978-0-415-12410-2. Saliba, George (1994). A History of Arabic Astronomy: Planetary Theories During the Golden Age of Islam. New York University Press. ISBN 978-0-8147-8023-7. Turner, Howard R. (1997). Science in Medieval Islam: An Illustrated Introduction. University of Texas Press. ISBN 978-0-292-78149-8. Al-Daffa, Ali Abdullah; Stroyls, J.J. (1984). Studies in the exact sciences in medieval Islam. Wiley. ISBN 978-0-471-90320-8. Hogendijk, Jan P.; Sabra, Abdelhamid I. (2003). The Enterprise of Science in Islam: New Perspectives. MIT Press. ISBN 978-0-262-19482-2. Hill, Donald Routledge (1993). Islamic Science And Engineering. Edinburgh University Press. ISBN 978-0-7486-0455-5. Kennedy, Edward S. (1983). Studies in the Islamic Exact Sciences. Syracuse University Press. ISBN 978-0-8156-6067-5. Morelon, Régis; Rashed, Roshdi (1996). Encyclopedia of the History of Arabic Science. 2–3. Routledge. ISBN 978-0-415-02063-3. Saliba, George (2007). Islamic Science and the Making of the European Renaissance. MIT Press. ISBN 978-0-262-19557-7. Habibi, Golareh. is there such a thing as Islamic science? the influence of Islam on the world of science, Science Creative Quarterly. This page was last edited on 9 April 2019, at 20:26 (UTC).